The Nextbase NB49AC portable DVD players are fitted with high resolution LED 640 x 234 RGB true colour pixels displays which ensures that you always get a perfect picture. Unlike many other portable DVD players the Nextbase units are specifically designed to be fully portable. They have a wide viewing angle and an inbuilt anti-skip mechanism which allows you to keep enjoying a film even on bumpy roads. The Nextbase NB49AC portable dvd player supports a huge range of discs and formats including DVD, VCD, SVCD, DivX, Xvid, MP3, CD, JPEG, CD-R/RW, DVD +/- R and DVD +/- RW so there is very little that this portable DVD player can't deal with. 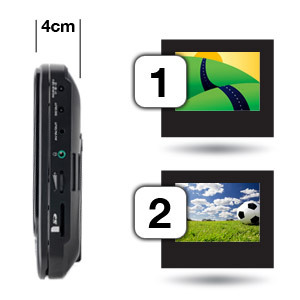 The wide range of format support means that it is not only a portable movie player but also a music player with support for audio CDs and MP3s, and a picture viewer with support for JPEG images. There is also a SD memory card slot and USB socket. This is a neat feature as you can store a number of movies directly from your PC, and then watch them whenever you like. The player itself has 2 x stereo speakers for enjoying the movie with friends or there is the standard 3.5mm headphone socket located on the side of the player to allow you to use headphones. Another great advantage of the new NB49AC portable DVD player is that it can be powered by its inbuilt 2 hour+ rechargeable battery pack. This allows the unit to be totally portable and used anywhere you like. 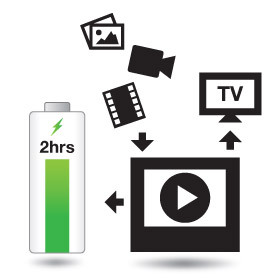 The battery is simply recharged using the included mains power supply. 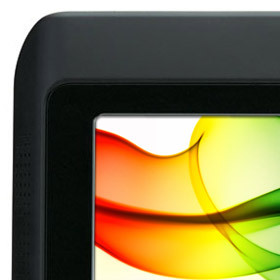 The rear of the Nextbase NB49AC portable DVD player features a picture frame style stand for standing the player on a flat surface such as a table. The system also comes with a car headrest mounting case for fitting your portable player in the car on those long road trips, together with a car cigarette lighter power adapter. The Nextbase NB49AC is an ideal present that will bring hours of entertainment and fun. The NB49AC is a high quality portable DVD player system backed by a full 12 month warranty for peace of mind.